An interview conducted with an IF author put me in the Providence, RI area, 40 miles from home. While in the short term it might seem to be efficient and businesslike to zip in, do an interview, and drive back, the day was beautiful and Providence can be lovely if you squint. I ended up walking along a nice area of shops and found myself in an antiques store named What Cheer that had a fun little assortment of old stuff. Items are plentiful and often well catalogued, although it would have been multiple days to truly find the gems I’d normally want. Lock picking, like a lot of other activities, can imbue you with a sense of power and ability due to the skillset that provides you access you might not otherwise have. The groups that have followed hackers around for years now have given untold hundreds a chance to understand more about the theories behind lock creation, and for reasons I can’t quite fathom this appeals handily to technical people of a specific stripe. My own lack of understanding aside, TEXTFILES.COM has an entire section on lockpicking with Master Locks coming under strongest scrutiny. M. Groves, a particularly cranky commentator on my weblog entry about the mystical number last Friday, will be glad to know that Master Lock sent out threats to people for printing how to undo their locks, even though what these files represented was research using items they had purchased, and which revealed pretty insane flaws in the Master Lock system. Locks are, after all, event consolidators, in that they prevent a range of events from occuring by consolidating them into a specific event; the triggering of a mechanism within the lock that causes it to release its hold on whatever it is attached to. The flaw or deeper issue, known for thousands of years, is that this in itself is not the sum total of required variables to prevent another event from happening. The strongest lock on a door won’t protect against a window next to it, or exposed hinges, or the key being accessible to the wrong people, or the wrong people being able to imitate a key. 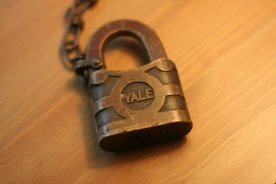 This particular lock, an old Yale one, was either used for railroad switchboxes, or maybe just someone’s shed. Naturally, I assume it was used to secure some sort of gate of Hell, long since undone and now leaving a brave band of heroes the task of gathering up the demons to return them from whence they came. Maybe they need their lock back! That’s the part “they” just don’t get. The REAL coorelation is that hackers like to learn and understand how things work, whether it’s cumputers or physical things (like locks). The more you try to hide how something works (like network security, or a Master lock) the more hackers want to know how they work.